We have been visiting my parents for the last couple of days and yesterday my mom and I made time for a quick trip to a local thrift store. I have to be super particular about giving into the temptation to buy dishes nowadays since my cupboards are overloaded. 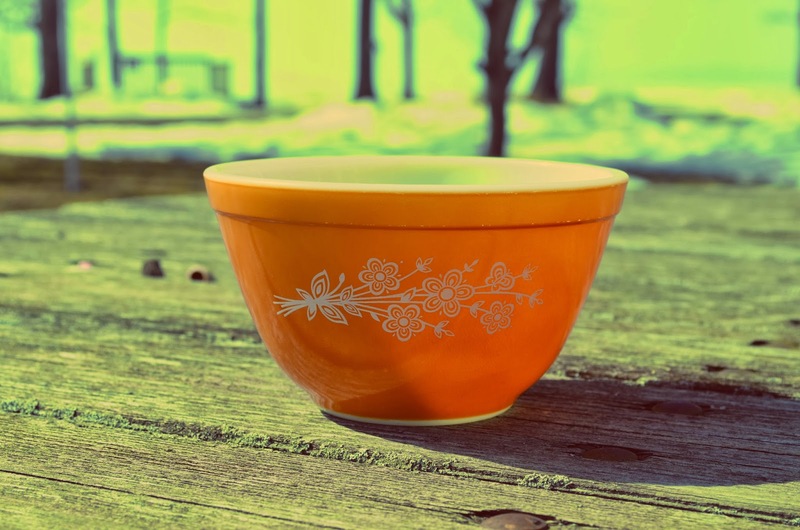 But I couldn't resist this pretty little orange Pyrex bowl. It speaks to me of springtime, even in the midst of all this snow. I also rarely resist a milk glass piece. They are so pretty and so darn cheap! This lovely dish was $2 and it has so many potential uses - as a vase, candy dish or soap holder perhaps? I find my urge to shop is satisfied with a couple of simple pieces such as these. I am trying to curb my thrift purchases to items that I will use in my home. Just yesterday I purchased a red leather magazine tote made by Crate & Barrel for $4.99. After washing it up, I placed several children's book inside for the grandchildren's next visit. 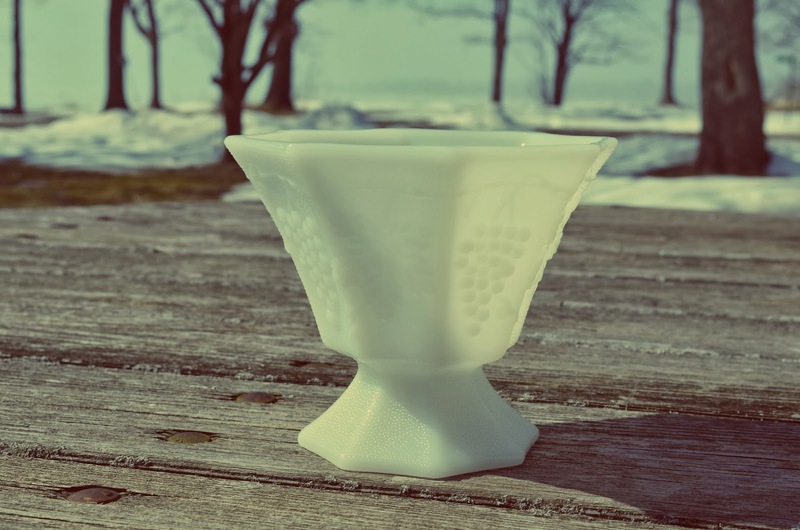 I like the shape of your milk glass piece, you are right, many different uses for that piece. I've been avoiding thrift shops because I always find something. That orange bowl is beautiful. $2 is an awesome deal! I am looking to play "Clue" again. I loved that game! I have two complete sets of those nesting bowls. They were shower gifts when I was married and have been used many, many times. Gives you a hint about how old I am! I had a casserole dish that was the same colors as that pyrex bowl, years ago... and a green one to match it. I haven't done any thrift shops lately but it is so fun! Love the orange bowl... great find! Nice finds! I really like them both. I just went on Sunday and came away with some vintage Corelle for my collection and two nice ruby-glass wine glasses. I sure do love the kitchenware but am with you and must limit temptation due to space restrictions! I love the ruby glass pieces too! So pretty! Great finds! I have that Pyrex bowl...it was part of a nesting set of 3 that I received as a wedding gift. Alas, the others are long since broken. A thrifty Pyrex find always makes my day and you got a great piece! Love the milk glass also. Thanks for sharing at TTF!